The Twin Cats are a 5-Piece Jazz-Funk band, based out of Indianapolis, Indiana. The Twin Cats were founded by identical twins Adam and Seth Catron, (drums and guitar/vocals, respectively). 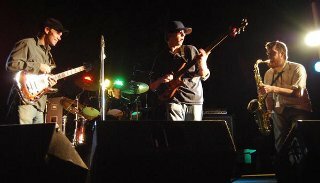 Cameron Reel (bass guitar) and Phil Geyer (keys) were added to the group shortly after the twins began playing together. The Twin Cats' sound was completed by the addition of Indy jazz artist, Nick Gerlach (sax/flute). From intimate venues to outdoor festivals, this group loves to entertain: Playing festivals such as 10KLF, Summer Camp, and F.U.N.K. Festival have given the band the pleasure of sharing the bill with some of the top touring acts in the country. The Twin Cats have also had the opportunity to open for artists such as The Greyboy Allstars, The Dirty Dozen Brass Band, Rusted Root, and Here Come the Mummies. Though easily recognized by the identical twins, ultimately, The Twin Cats are best recognized for their innovative funk grooves, fused with unforgettable jazz melodies. They never have trouble engaging a crowd.